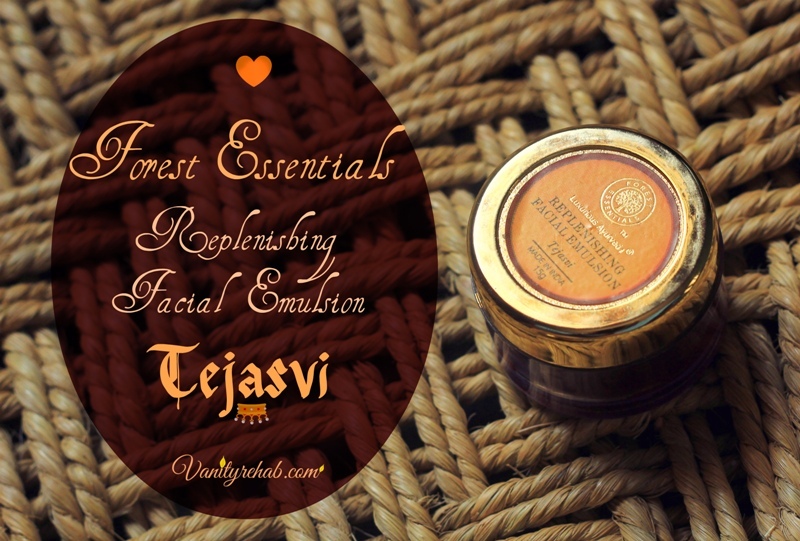 Vanity Rehab: Review: Forest essentials Replenishing Facial Emulsion-Tejasvi. This is one Gem of a product for Dry skin! 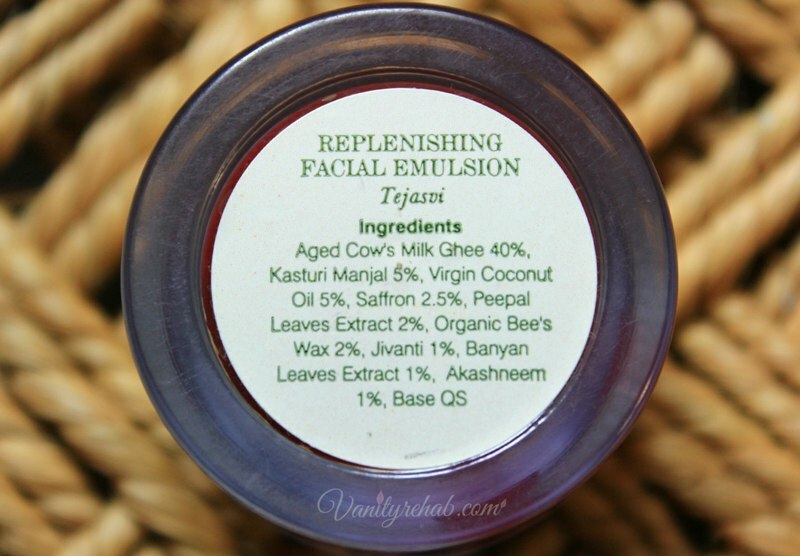 Review: Forest essentials Replenishing Facial Emulsion-Tejasvi. This is one Gem of a product for Dry skin! Today i am going to talk about this Gem from the luxury ayurveda brand: Forest Essentials. Read on to know how it found a place in my Green Tiara. Price: 2,275/- INR for 50 gm. Seems like our money is being put to good use by this brand. Yes! Go on.. Read for yourself about it HERE. Mine is a sample size jar of 15 gm which i chose during checkout of my online order. Bio-accumulation/Eco-toxicity: No. They claim to be constantly looking at ways to reduce their carbon footprint and focus on using renewable plant sources in their products. Organic ingredients: Yes. They derive their herbs from sustainable agriculture and source their other ingredients from suppliers who confirm to the strictest quality standards. Making of the Product: This extraordinary product takes many months to prepare, as it is first processed from “Ghee” made with Cow's milk. Cow's milk is much finer and lighter in texture than the more creamy Buffalo milk, and requires much more milk to make a small amount of Ghee. This Ghee is then “aged” according to Ayurvedic texts, with pure Saffron, and mixed with potent herbs like Jivanti for firming & toning, Manjistha for refining skin texture, Cluster Fig for clarity and Kasturi Manjal for smoothness and elasticity. This is mixed into earthenware pots and buried beneath Banyan trees for about 2 months. It is then cooked on a slow fire with the addition of some fresh Cow's milk, virgin Coconut oil and fresh Rose petals. What the Company Claims: This rejuvenating facial massage cream is specially formulated from the ancient Tejasvi formulation in Vedic texts to lighten and brighten the skin. This unique Emulsion removes blemishes and pigmentation by combining the potent properties of age-old Ayurvedic herbs, pure whole cream cow's ghee, sweet Almond oil, virgin Coconut oil and Kokum butter blended with purifying and skin lightening and brightening herbs, root and flower extracts, leaving your skin supple and radiant. How to use: After cleansing the skin as per your normal routine,apply a small dab of emulsion on Forehead,cheeks,nose and neck each.Massage well into skin for at least fifteen to twenty minutes with upward strokes.Wring out a small towel in hot water,and place on face for one minute.Wipe off excess emulsion. That Burgundy Balm... It looks much darker in person. 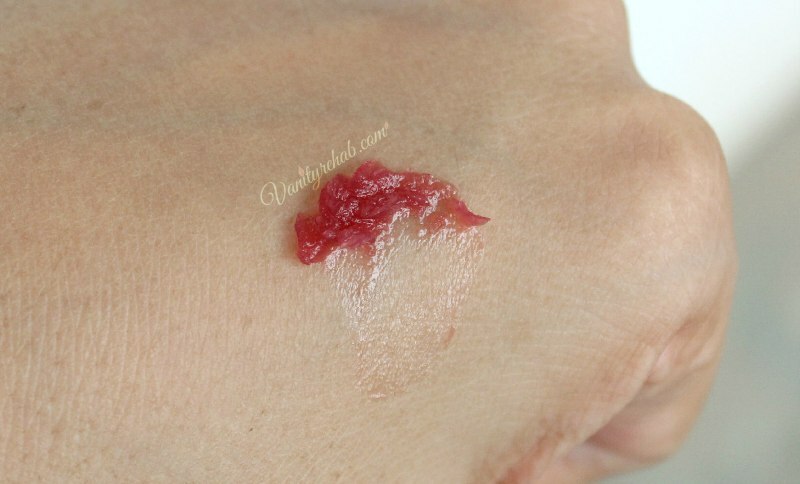 Looks like cherry jam right? Texture/Fragrance: Thin but lusciously rich and velvety ghee/clarified butter+creamy vaseline texture but doesn't feel as greasy and heavy as ghee. It has a moderately pleasant herbal fragrance with strong hints of ghee. It never irritates the nose unless you have a problem with herbal smelling products or with the odour of ghee/clarified butter. I just impulsively chose this while some 4 or 5 sample options showed up during chekout. I still don't understand why i chose this balmy product when all i had was a skin from which you can easily squeeze out a tanker full of oil! :P. I tried it eagerly just as instucted one night and given the hot and humid Chennai weather with some oily skin mixed in, my skin felt all clogged up, kind of sweaty, itchy and highly uncomfortable. I felt like dunking my face in a palm full of facewash and wash it off. And there it goes to the back of the shelf! Never dared to use it again. It sat there for nearly a year before the oppurtunity to use it came up. After i was diagnosed with MS, i went through a phase of severe stress and depression which i think messed up my hormones and thereby made my skin go crazy. It shifted from super oily to extremely dry. It became super dry, itchy and sensitive. I tried applying milk, ghee and what not as overnight treatments but nothing worked. Milk and ghee broke me out. Finally, i stumbled up on this li'l jar and decided to try it. This time, i used it as an overnight treatment by rubbing it in allover my clean warm damp face and the morning after.........WOW! I woke up with soft and soothed skin which felt restored from deep within! It dramatically reduced the dryness and stretchiness. From then on, this has been my Savior.... my Knight in shining jar. I've been using it every alternate day for the past 2 months. It never worked for me when used as per brand's instructions because massaging for such prolonged time always irritates and breaks out my acne prone skin. So, i just devised my own way where i used it as a leave-in overnight treatment/spot treatment. Like they say....To each his own. (But yeah, you are going to look like a toned down version of red devil until it settles and gets a li'l absorbed :P). 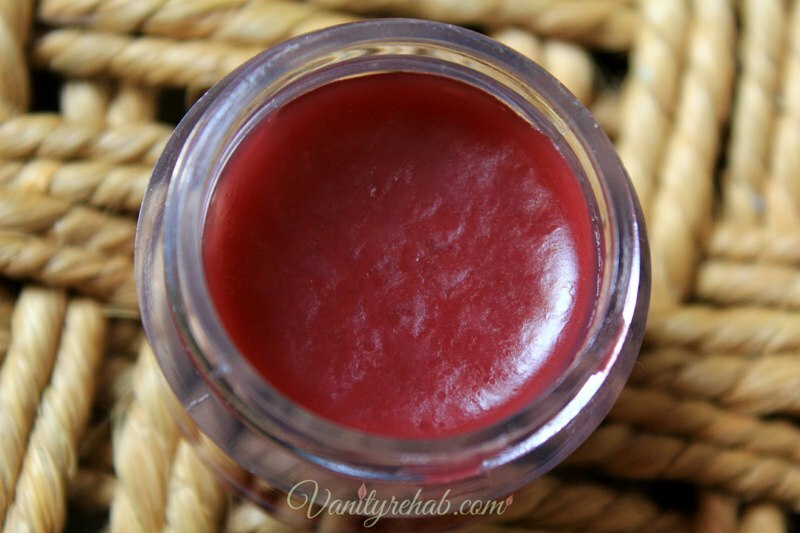 I always carry this tiny jar in my bag and touch up on dry spots for instant relief. 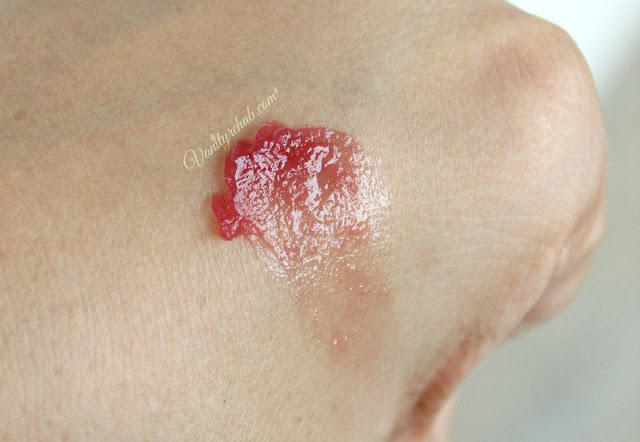 But, one notable drawback is that skin feels a little tingly for a while after application and may feel super irritating for people with hyper sensitive skin. Since this is a sample size jar, i am now using it as a spot treatment mostly on the driest spots on my face and it is going to last me another month or more for sure. Restores and nourishes dry skin from deep within. Skin feels smooth and supple with regular usage. Gives dull skin a healthy glow after each use. Made with ghee and herb mix which is aged for 2 months by burying under banyan tree. Does not breakout or give cystic acne even with ghee and coconut oil in it's ingredients. Heals acne/inflammation on dry skin to an extent. Mildly greasy and absorbs in to the skin to a fair extent. Gives a very mild tingling sensation after application. Hence, not suitable for hypersensitive skin. May trigger breakouts oily skin. Does not work in hot and humid weather even if you have normal skin. Some may not like the ghee/clarified butter odour. They did not mention what goes in to the base. Would've been easy to not mind if they were certified by any of the reliable natural cosmetic certifying bodies. Click HERE to read my post about Greenwashing. My conclusion: If you have bothersome dry skin, have dry patches/spots, have a dry skin condition or have dull lifeless skin then you should definitely get your hands on this Gem.